Acute RRT is used largely for supportive management of patients with severe AKI. Despite published clinical practice guidelines on RRT for AKI, no consensus exists on the optimal timing to initiate RRT, resulting in a wide variation in clinical practice. Similarly, no high-quality evidence exists for improved outcomes with a specific RRT modality, resulting in significant heterogeneity in the prescription and delivery of acute RRT. In this manuscript, we use an illustrative clinical patient to discuss clinical decision making regarding RRT initiation, modality, and prescription in a complex clinical setting. LT, a 38-year-old woman with obesity, diabetes mellitus type 2, nonalcoholic steatohepatitis cirrhosis, and recurrent hepatic encephalopathy is brought to the Emergency Department for 2 days of confusion. She is active on the liver transplant waiting list. She is somnolent. Oral temperature is 38.4°C, BP is 88/46 mmHg, heart rate is 112 beats per minute, respiratory rate is 22 breaths per minute, oxygenation saturation is 98% on room air, and weight is 100 kg. Physical examination is significant for jaundice, bulging abdominal flanks, and edema. Outpatient medications are furosemide, spironolactone, lactulose, potassium chloride, and metformin. Five weeks ago, her serum creatinine was 0.9 mg/dl, and Model for End-Stage Liver Disease score was 20. Laboratory studies are summarized in Table 1. Chest radiograph is clear. She is intubated for airway protection, fluid resuscitated, pancultured, and admitted to the intensive care unit. She is started on vancomycin, pipercillin-tazobactam, albumin (100 g/d), norepinephrine infusion, and lactulose enemas. Results from a diagnostic paracentesis are unremarkable. Repeat laboratory studies 6 hours after admission are listed in Table 1. Urine output is 25 ml/h. Head computed tomography shows no cerebral edema. Nephrology is consulted for worsening AKI, acidemia, hyperammonemia, and decreased urine output. The timing of RRT in critically ill patients who have AKI but no potentially life-threatening indications remains controversial. Two recent randomized, controlled trials investigating timing of early versus delayed RRT initiation in severe AKI showed opposite results, likely due to differences in trial design and relatively small sample size (1,2). Two other large randomized, controlled trials evaluating appropriate RRT timing are currently ongoing. Our patient does not meet the traditional urgent indications for dialysis, and her altered mental status can be explained by hepatic encephalopathy and sepsis rather than uremia. Although initiating RRT now may facilitate better fluid balance and electrolyte and acid-base homeostasis, it may also expose her to unnecessary risks if she recovers kidney function spontaneously. Thus, with the lack of high-quality evidence, the decision to initiate RRT in LT remains a matter of clinical judgment and should take into consideration the etiology and severity of her AKI, potential nonkidney indications for RRT, the risks and benefits of RRT, and her clinical trajectory. The presence of urinary muddy brown granular casts in conjunction with the clinical context suggest that LT has acute tubular necrosis. The approximately twofold rise in serum creatinine and the urine output <0.5 ml/kg per hour categorizes her AKI as moderate severity (Kidney Disease Improving Global Outcomes [KDIGO] stage 2) (3). Although the severity of AKI (on the basis of the serum creatinine level, the serum creatinine trajectory, and the amount of urine output) can help predict the need for RRT, AKI severity in patients with cirrhosis is difficult to interpret due to physiologic oliguria and lower serum creatinine levels from decreased muscle mass, decreased creatinine synthesis, and dilution of creatinine from edema and ascites (4). On the basis of her creatinine level, LT likely has more severe kidney dysfunction than indicated by AKI staging. Nevertheless, because of the lack of urgent indications and the concern for dialysis catheter insertion complications with her coagulopathy, we opt not to start RRT at this time, with the provision that her clinical condition and laboratory values are frequently reassessed. Other potential indications when consider initiating RRT in LT are nonkidney indications, such as clearance of metformin and ammonia. Metformin is excreted solely in the urine unchanged, and in anuric AKI, metformin clearance falls to zero. Despite an absence of hepatic metabolism, metformin use is cautioned in patients with liver failure due to risks of AKI and worsened metformin-associated lactic acidosis. LT has multiple potential causes for her lactic acidosis other than metformin toxicity, including septic shock and liver failure. She does not meet the Extracorporeal Treatments in Poisoning Workgroup recommendations for dialysis for metformin toxicity (e.g., lactate >15 mmol/L or arterial pH <7.1 in the setting of presumed metformin toxicity with liver failure or decreased level of consciousness) (5). 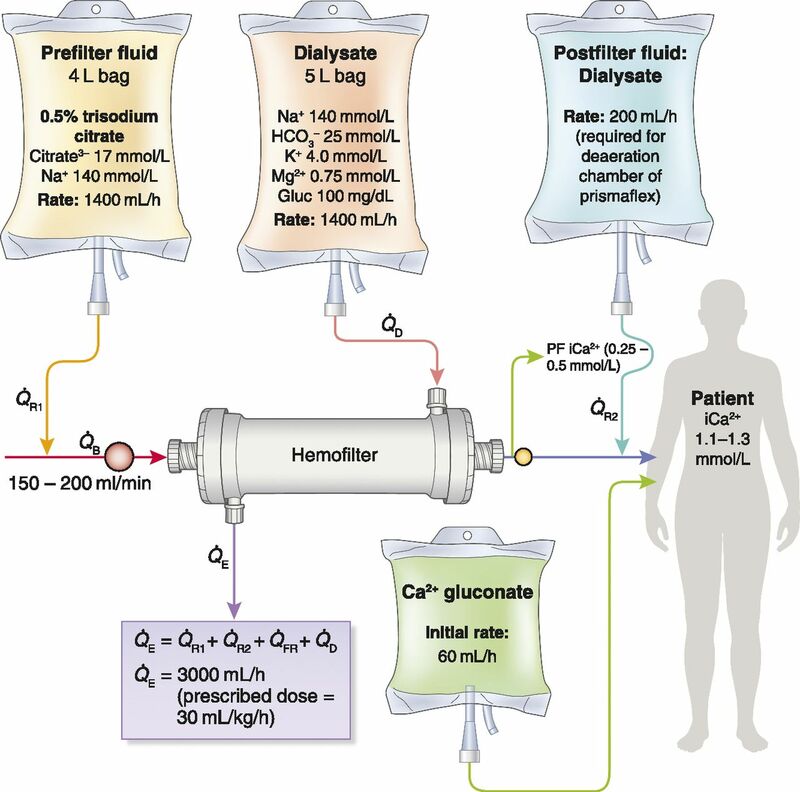 Because ammonia has similar dialytic properties as urea and is freely removed with dialysis, dialysis can be an important adjuvant therapy in critically ill patients who are at risk for cerebral edema from hyperammonemia. Most of the experience of managing hyperammonemia with dialysis comes from pediatric patients with urea cycle disorders. In adults, dialysis has been used for blood ammonia levels ≥200 μmol/L, because those levels are associated with poor neurologic outcomes and death (6). Given that LT’s ammonia level is <200 μmol/L, medical management is continued without the initiation of dialysis. LT clinically declines, and vasopressin is added to norepinephrine for hemodynamic support. Urine output falls to 15 ml/h. Laboratory values obtained 24 hours after hospitalization are summarized in Table 1. Klebsiella is isolated from blood and urine cultures. It is resistant to pipercillin-tazobactam, and antibiotics are changed to meropenem. With a greater than threefold rise in serum creatinine and urine output <0.3 ml/kg per hour for 24 hours, her AKI is now categorized as severe (KDIGO stage 3) (3). In the setting of Klebsiella sepsis, worsening hemodynamics, and liver failure, her clinical trajectory suggests that her kidney function is unlikely to improve over the next few days, and we start her on RRT for solute clearance, volume support, and acid-base control. Which Modality of RRT Should Be Used? Randomized, controlled trials have not shown a survival benefit of continuous RRT (CRRT) over intermittent hemodialysis or prolonged intermittent RRT (PIRRT). CRRT and PIRRT are preferred for the treatment of AKI in the critically ill population, because they are associated with less hemodynamic instability. PIRRT uses blood flows of 150–350 ml/min and dialysate flows of 100–500 ml/min for 6–12 hours (3). Intermittent hemodialysis or PIRRT may be favored if patient mobilization is the priority. CRRT is preferred over intermittent hemodialysis in patients with elevated intracranial pressure or increased risk of brain herniation from cerebral edema. Slower solute clearance with CRRT minimizes the risk of cerebral edema. Although our patient’s head computed tomography does not reveal cerebral edema, her increasing ammonia level places her at an increased risk for developing it in the future. Therefore, CRRT is chosen for continued and safe removal of ammonia in the setting of worsening hemodynamics. CRRT techniques use diffusion, convection, or a combination of both for solute clearance. Convective therapies require replacement fluid, which can be infused before the hemofilter, after the hemofilter, or both pre- and posthemofilter in varying amounts. The use of postfilter replacement fluid is limited by the filtration fraction, which is defined as the fraction of plasma water that is removed from blood during ultrafiltration. Clinical practice suggests that the filtration fraction should be kept <20%–25% to prevent hemofilter clotting (7). Specific CRRT teaching points are elaborated on in Table 2. Despite increased clearance of middle molecular weight molecules with convective techniques, no study has shown that convective therapies improve patient survival compared with diffusive therapy. Therefore, choice of CRRT modality should be on the basis of clinician preference and expertise and CRRT machine capability. We use continuous venovenous hemodiafiltration, because it provides both convective and diffusive clearance, allows us to use a citrate-based replacement fluid for anticoagulation, and gives us the flexibility to increase dose through diffusion with minimal effect on filtration fraction. In our patient, continuous venovenous hemodiafiltration was initiated with blood flow of 200 ml/min. Total effluent amount was divided equally between the replacement fluid and dialysate. The replacement fluid was given mostly prefilter, except for a postfilter replacement fluid rate of 200 ml/h (Figure 1). Continuous venovenous hemodiafiltration (CVVHDF) schematic for the clinical patient. B, blood; D, dialysate; E, effluent; FR, fluid removal; PF iCa2+, postfilter ionized calcium (from the blue port); Q, volume flow rate; R1, prefilter replacement fluid; R2, postfilter replacement fluid. Should CRRT Anticoagulation Be Used? Most patients, including cirrhotics with coagulopathy, require some form of anticoagulation to prevent clotting of the CRRT circuit, and the risk of circuit loss must be balanced against the risk of anticoagulation. The KDIGO guidelines for AKI recommend that regional citrate anticoagulation be preferentially used over heparin (3). Citrate is infused into the blood at the beginning of the extracorporeal circuit and chelates ionized calcium. Optimal regional anticoagulation occurs when the hemofilter ionized calcium concentration is <0.4 mmol/L (8). A portion of the calcium-citrate complex is lost across the hemofilter, whereas the rest enters the systemic circulation, where citrate is metabolized by the liver to bicarbonate and calcium is released into the circulation. Calcium is infused back to the patient to replace the calcium lost across the hemofilter. Patients with severe shock liver and lactic acidosis may not be able to metabolize citrate. Citrate toxicity is characterized by low systemic serum ionized calcium level, elevated serum total calcium level, total calcium to systemic ionized calcium ratio >2.5, increasing anion gap acidosis, and escalating calcium infusion requirements (9). Nevertheless, regional citrate anticoagulation has been used safely in patients with advanced liver disease as well as perioperative liver transplant patients (10). Citrate accumulation can be minimized with the reduction in citrate infusion and increase in effluent flow to promote citrate clearance. Also, the transfusion of citrate-containing blood products can increase citrate accumulation. In our patient, continuous venovenous hemodiafiltration is initiated with a custom-made isotonic low-concentration citrate solution (0.5% trisodium citrate and sodium 140 mEq/L) used as both replacement fluid and anticoagulation. Postfilter ionized calcium levels are targeted for 0.5 mmol/L instead of <0.4 mmol/L given her risk for citrate toxicity. Although serum electrolytes and systemic and postfilter ionized calcium levels are routinely measured 1 hour after initiation of citrate and then every 6 hours with our citrate protocol, we increase the frequency of measurements in patients at risk of citrate accumulation. What Dose of CRRT Should Be Prescribed? Clearance of urea in CRRT is proportional to the effluent rate. The KDIGO Clinical Practice Guidelines for AKI recommend a minimum effluent flow of at least 20–25 ml/kg per hour as long as the target dose of therapy is actually delivered. However, the prescribed CRRT dose should be adjusted and tailored to the patient’s clinical need. In patients with severe metabolic acidosis (i.e., arterial pH <7.1) or toxicity (e.g., metformin, methotrexate, salicylate, hyperammonemia, etc. ), the CRRT dose may need to be increased above 40 ml/kg per hour. In severe acidosis, a higher dose delivers more bicarbonate while removing more solute. Higher CRRT doses can result in significant loss of nutrients, phosphate, potassium, and other solutes, including antibiotics. Antibiotic dosing and nutrition have to be monitored and adjusted appropriately. Our patient was targeted for a higher CRRT dose of 30 ml/kg per hour to increase solute clearance and account for potential CRRT machine downtime. Given her weight of 100 kg, her effluent rate was prescribed at 3000 ml/h (30 ml/kg per hour ×100 kg), which was divided between replacement fluid and dialysate. Notably, the weight used for CRRT dosing in randomized trials has differed, with some trials using actual body weight at CRRT initiation and others using the weight before the onset of illness. Most studies excluded individuals >100–128 kg or used a modified weight target. Therefore, uncertainty remains about the correct weight to use for dose, especially in the obese. LT was initiated on continuous venovenous hemodiafiltration as described in Figure 1. Fluid removal was initially prescribed at 60 ml/h to match the accompanied calcium infusion rate and then slowly titrated upward on the basis of hemodynamics to prevent fluid overload. Eventually, she was weaned off pressors and extubated. She was transitioned to intermittent hemodialysis and transferred to the floor. In summary, there are many acceptable approaches toward dialysis in AKI. This patient discussion outlines some considerations when choosing to initiate RRT in AKI and specifically summarizes our experience with CRRT and citrate anticoagulation. E.J. receives institutional support from Baxter Healthcare Corporation Deerfield, IL. A.T. serves as a consultant for Baxter Healthcare Corporation and holds the patent for 0.5% citrate solution. This work was supported by a research grant from the National Institute of Diabetes, Digestive, and Kidney Disease (K23 DK102660 to E. J. ).